The Odisha Government had appealed to the Centre for sanctioning a Special package of Rs.4500 Crores for the development Projects in undivided KBK Districts, by far the most backward region of the Country. As was expected, the Centre ignored Odisha’s appeal. Whereas Mamata Bannejee had recently submitted a request for sanctioning special assistance of Rs.21,600 Crores to Bengal, to bail out the State from financial crisis and the Centre ( courtesy Pranab Mukherjee ) promptly sanctioned the same. Please read the details from the appended Article published in the Pioneer, dated the 8th August’11. Such step motherly attitude of the UPA Government at the Centre is not only shocking but also condemnable. Such discriminatory treatment towards Odisha clearly reflects that the present Government in Delhi does not consider Odisha as a part of the Nation and it has to fend for itself. If that is so, then why should State supply Coal andIronOre to other States with a paltry sum of Royalty ?? Let the State be allowed to charge the International Market Price to all Consumers outside the State and to those Consumers ( in Odisha ) supplying Power to other States. Let the State control all Mines and Minerals of the State and generate resources to meet State’s financial needs. This is a serious matter and all Intellectuals of the State should react to UPA’s ( more appropriately the Congress Party’s ) step motherly attitude towards Odisha. The Centre has granted a package of Rs 21,614 crore to West Bengal, which included Rs 9,240 crore in grant in aid, to tide over its acute financial crisis. “We have received a fax message which says that the Centre has given us an allowance, not a package, of Rs 21,614 crore,” West Bengal Chief Minister Mamata Banerjee told reporters in Kolkata. Mamata could manage to get the Central assistance barely some months after assuming office at the Writers Building. On the other hand, Odisha’s 11 year old BJD Government headed by Naveen Patnaik, however, have spent all its energies in persuading the Planning Commission as well as the Centre to release a special package worth only Rs 4,500 crore for Special Plan for backward Kalahandi Bolangir Koraput(KBK) region. For last three years Odisha Government is asking the Union Government to provide the much needed grant of Rs 4,500 crore for KBK region, which is the poorest zone of the country. Chief Minister Patnaik has written half a dozen letters to Prime Minister and Deputy Chairman of the Planning Commission urging them for the support. Minister Planning and Coordination A U Singh Deo has approached Montek Singh Ahluwalia several times in this regard. And BJD MP from Balangir Kalikesh Narayan Singh Deo has also met the Members of Planning Commission to impress them for the support time and again. But nothing has happened so far. How and why West Bengal got the assistance and not Odisha. The statement issued by Banerjee explains how the Trinamool Congress led Government could get the assistance Mamata said, “Though I am not fully satisfied, I congratulate the Prime Minister and the Union Finance Minister. I know they will have to follow rules. Congress leader Pranab Mukherjee from West Bengal came to the rescue of the State Government. It is not that Pranab Mukherjee helped Mamata as his party is in coalition with the Congress. The Union Minister Finance had arranged special funds for West Bengal when left front was in power also. Contrary to Pranab’s inclination towards Bengal, a senior Congress leader from Odisha urged the Prime Minister not to grant funds under Special KBK Plan to the State as the BJD Government misutilises public money. Problem with Nabin is that he himself has failed to dictate terms when he was in a similar position as that of Mamta is to day. The crocodile was holding the key portfolios of both Steel as well as Mines minister but he totally failed to do justice to rectify anti people mining policy but now sheds tears that center is not listening to him. The failed coward now blames others. We talk of special packages, but if we look at the records of utilisation of funds, we find a sorry state of affairs. When the already allocated funds are not utilized, with what face Nabina can dare to ask for special package? KBK is in dire state, situation has not improved despite spending crores of rupees, CBI inquiry is already on in the huge NREGA corruption worth over Rs. 550 Crore, Corruption in almost all the developmental works is the Mantra to govern the state, and if the special package even if it comes by the grace of Lord Jagganath ( even thy land is also sold by greedy Nabina to eagle eyed Anil Agarwal of Vedanta). I agree with Durga Prasad Mishra ji and would like to add that we can not expect to bring in a change for the better till this bugger is in charge of the state. He will sell each and every inch of land of the farmers and tribals before flee back to USA from where he has come. Puppet in the hand of Pyari can not do any good to the people of the state. -Just asking grant from the center is not enough. 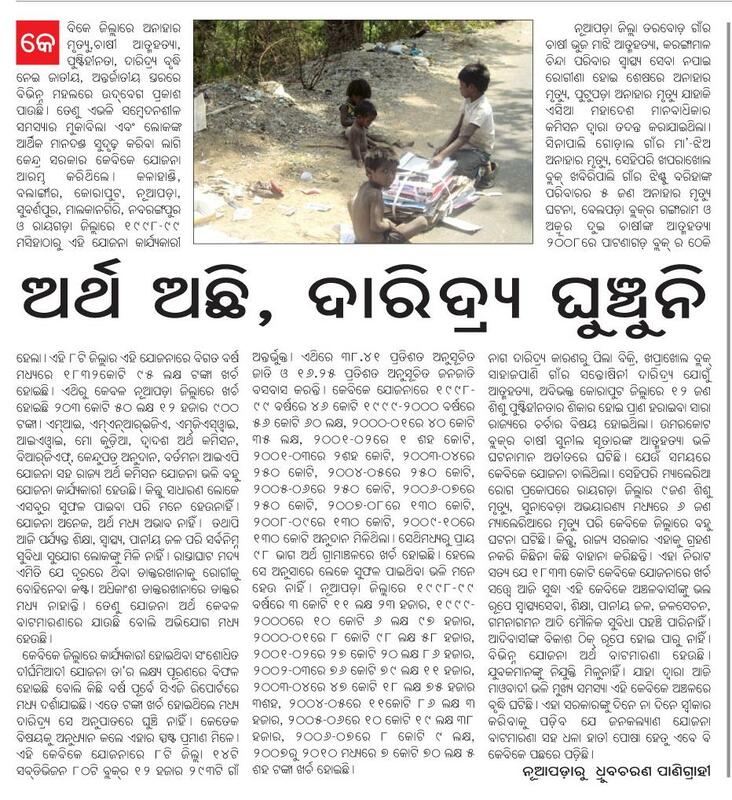 The Odisha govt. must give details of the previous expenditure on KBK. -Despite so many central grants why the KBK is in a sorry state? It is because the state govt. has failed to implement the grants and mismanaged the money. 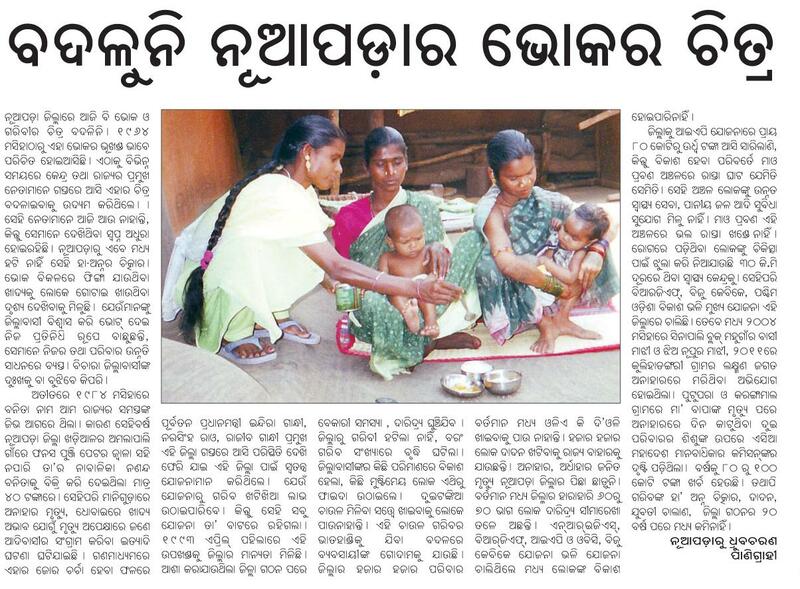 -Many of the central grants are returning to the centre as the Odisha govt. is unable to spend the money. In this situation, the KBK area should be declared as a union territory. There is no pointing in asking packages after packages and swallowing all the money meant for poor people. I think, KBK desreves to be given urgent priority for upgrading by the center as well as the state but the developmental work should be undertaken directly by the central government in a planned and determined way.The central government has a good record in doing developmental works in Union territories.Just look at all the centrally administered territories ! If they could do it in Andaman and Nicober, they certainly can do it in KBK. If the Orissa government can not do the job, it should admit it, and ask the center to take over the implementaion of projects. If Chidambaram was asked to tackle the Naxal problem by requesting armed forces because Orissa government could not control the problem, he could be asked for transforming KBK in to a viable place. It will be good for KBK as well as good for Orissa. And certainly it will be a better model to counteract the Naxal menace. There are lessons to be learnt fromSikkimtoo. A series of dams to be constructed for hydro power generations were scrapped by the strong protests of the people. 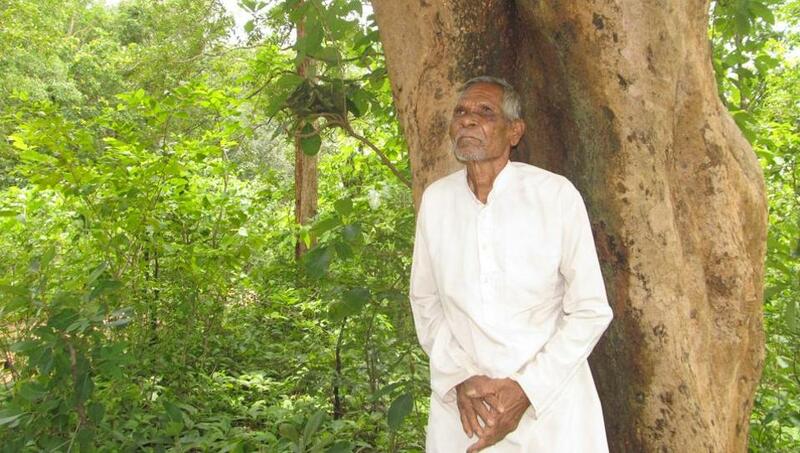 Here Nabin has gone mad to acquire land even at the cost of grossly misusing the police force for POSCO. NowSikkimhas almost all the big pharmacy companies having established medicine manufacturing plants with huge investment since there is zero pollution and suitable climatic conditions. Here in KBK also there is near zero pollution in the areas where there are no Vedanta type culprits. State actors should avoid polluting industries in KBK and other areas too by devising special packages for zero polluting industries and invite them to make investments that will be good for the people as well as earn revenue for the state unlike the eagle eyed looters of mineral wealth who have no love for the poor people of the area. Ask for a special incentive like that of exemption from payment of income tax and other sops that too for a limited period. Only problem for the gangsters in power is that they may not get any kick back the way they are believed to be paid by the mineral looters who ink MoUs for getting iron ore or bauxite etc.